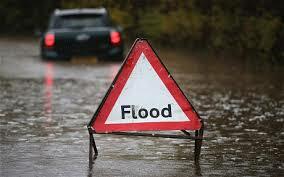 My customers have had lots of valuable experience drivng in wet weather conditions recently. News from the Met Office shows that December and January combined were the wettest in the previous one hundred years and that January had twenty three days of rain. One of the key points at Prodrive Driving School we’ve been talking about is the increase in braking distances. Water on the ground reduces the contact that a tyre would normally have and increases braking distance by at least double. As a result we’ve been keeping well back from the vehicle in front. This brings us other benefits as well. We can see further ahead and anticipate earlier any developing hazards. As important as the ability to see is being visible yourself to others. Opinions appear to differ amongst drivers as to what lights to use when driving in rain. Sidelights, headlights or fog lights? Save sidelights for parking. You may as well stick Christmas lights on your bonnet for how bright they are on some cars. The Highway Code is very clear on the use of fog lights. Only use them when visibility is seriously reduced, that is to no more than one hundred metres. Finally, take extra care around pedestrians. A twenty two year old man from Colchester has been summonsed to appear in court for careless driving after he allegedly drenched children walking to their primary school by driving through a puddle. He is being prosecuted under Section 3 of the Road Traffic Act, which relates to careless and inconsiderate driving, an offence that carries a maximum fine of £5,000 as well as between three and nine penalty points.